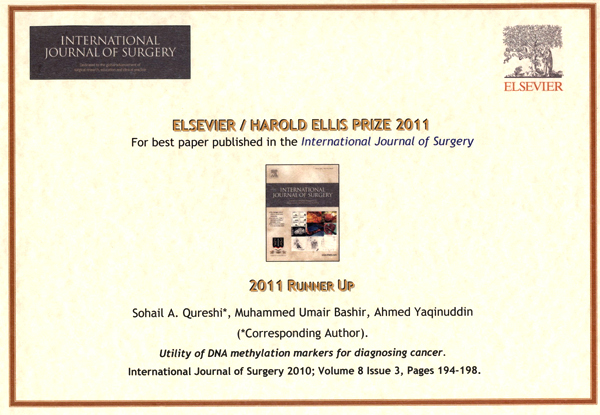 The International Journal of Surgery awards the prestigious annual Harold Ellis Prize in Surgery (Est. 2003) in recognition of scientific papers judged to be outstanding. Dr Ahmed Yaqinuddin, Assistant Professor of Anatomy at Alfaisal co-authored a review article entitled “Utility of DNA methylation markers for diagnosing cancer”. This article has been chosen for Harold Ellis Prize in Surgery, 2011 (Runner-up). The article reviews the recent literature on DNA methylation and how aberrations in DNA methylation patterns can lead to cancer. It gives insights on how discriminative patterns of aberrantly methylated DNA in cancer patients can be used to detect cancer non-invasively using cell free DNA from serum/body fluids of cancer patients. It also reviews literature on the development of sophisticated new technology platforms which have made it possible for us to identify discrete DNA methylation marks for different types of cancers. This is an exploding area in cancer biology and can lead into development of very sensitive and specific biomarkers for cancer detection. Alfaisal congratulates Dr. Ahmed Yaqinuddin for this achievement!